Triaxial Cell, for 6in dia. 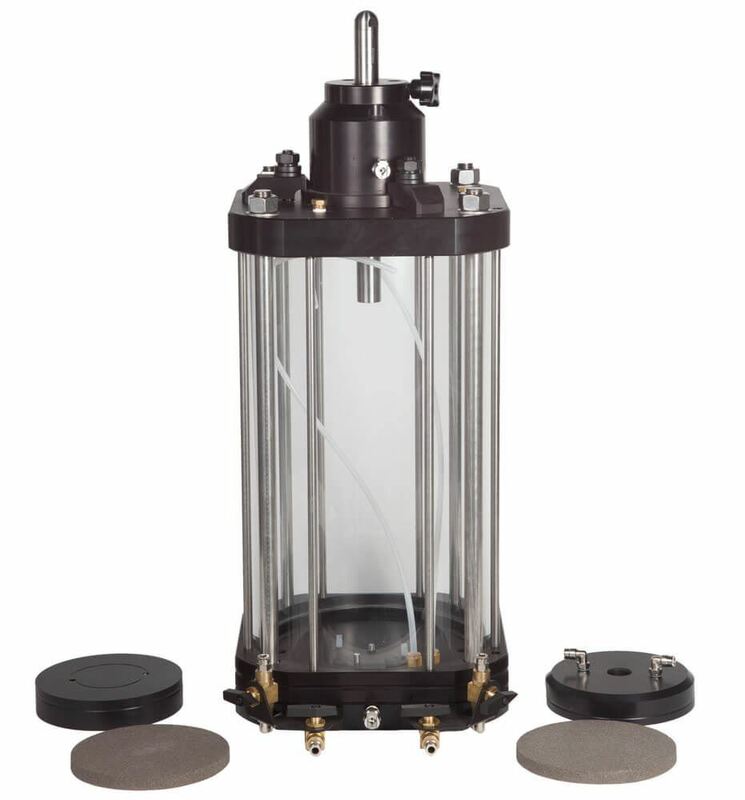 Specimens - Gilson Co.
Triaxial Test Cells for 6.0in (152.4mm) specimens operate at peak performance with the HM-350M Master Control Panel and HM-350A Auxiliary Control Panel, as well as equipment from other manufacturers. 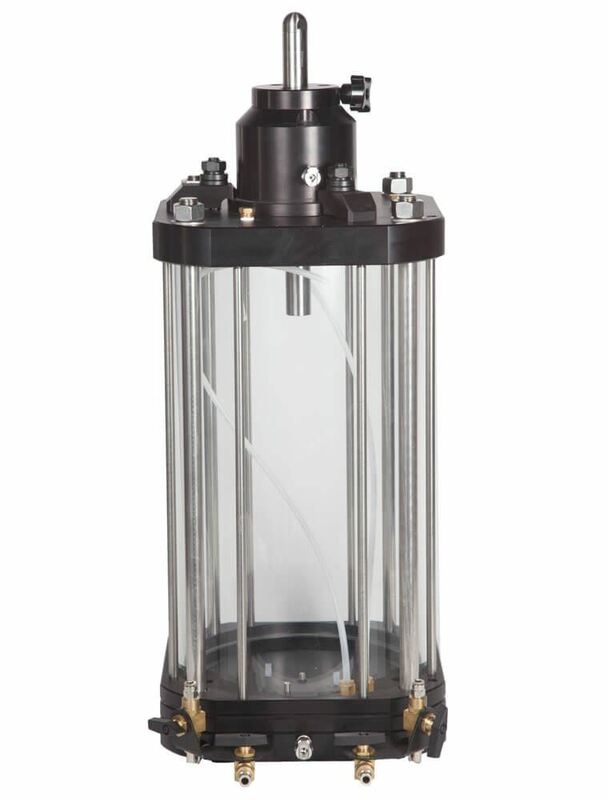 In addition to solid performance in triaxial testing of soil, these units function well in asphalt permeability testing. 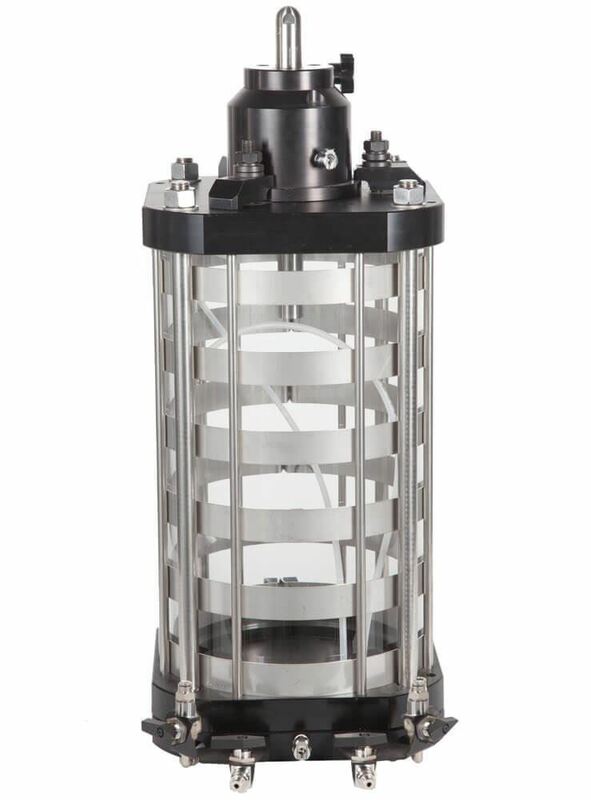 The HM-519 cells have valves and fittings made of either rugged quality brass or durable stainless steel and are equipped with machined-aluminum bases for heavy loading. The heavy-wall clear acrylic chamber has a 9.625x18in (244.5x457mm) interior. Its polished stainless steel, precision-ground load piston features internally lubed and sealed linear ball bearings for very low friction. 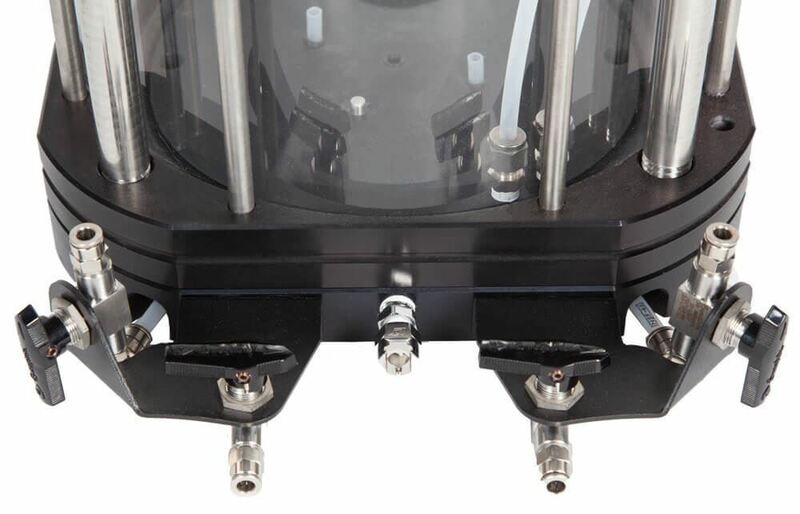 The test cell also features precision zero-volume change ball valves and has a maximum operating pressure of 100psi (6.9bar) for standard models or 250psi (17.2bar) for high-pressure models. Inquire about cells that can handle higher test pressures. 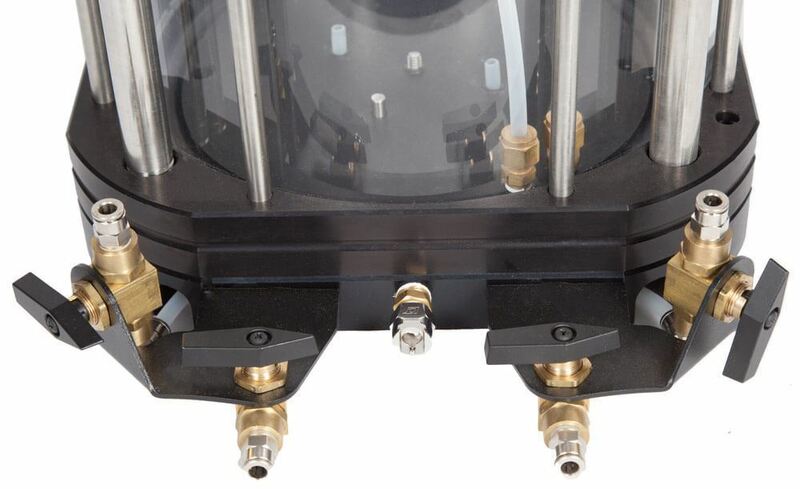 HMA-519 Triaxial Cell includes brass valves and fittings. 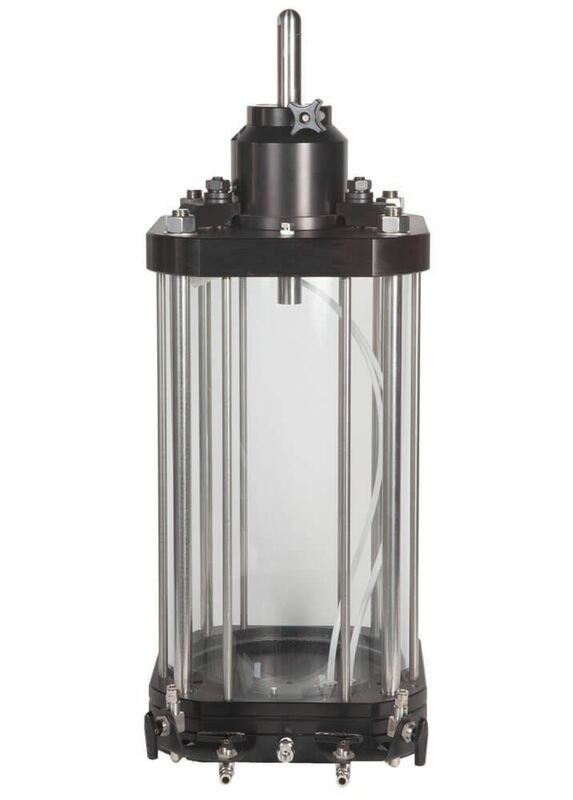 HMA-519S Triaxial Cell comes with stainless steel valves and fittings for corrosion-resistance and to withstand harsh permeant fluids. HMA-519H High-Pressure Triaxial Cell includes brass valves and fittings. The cell is reinforced for a maximum operating pressure of 250psi (17.2bar). HMA-519HS High-Pressure Triaxial Cell is reinforced for a maximum operating pressure of 250psi (17.2bar) and comes with durable and corrosion-resistant stainless steel valves and fittings. All the necessary components needed for use with HMA-519 models and testing 6in (152.4mm) specimens are contained within the HMA-586 Triaxial Test Cell Kit, which is required and available separately. Kit components correlate to sample size and include an anodized aluminum cap and pedestal, two Porous Stones, two Latex Membranes and four O-Rings. Also recommended for use with Triaxial Test Cells and available separately is a 1.5gal Deairing Tank.